Hello. I am a novice for OpenCascade. In these days, I was trying to build OpenCascade 7.2 from source using CMake, but failed to build. I got a solution, whose problem comes from OpenCascade 7.2 source package with incorrect file names. I corrected these kind of files (.cxx0000777, .hxx00000777, .pxx0000777 to .cxx, .hxx, .pxx), everything was fine. This problem may comes from my zip program. However, please check the source package. There are no such files in archive; 7zip unpacked opencascade-7.2.0.tgz archive without issues. I used Alzip for unpacking. 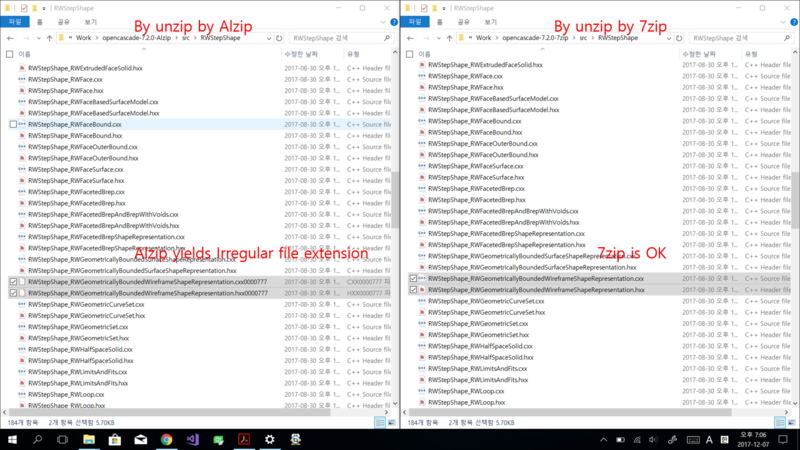 I used Alzip for unpacking. It yields some files with irregular file extension. As you say, I checked the archive using 7zip. 7zip is OK. I attached a screen shot. How to set up the environment variables for building the whole solutions?